I would probably rather have had a potion that turned me into a frog than this. For a book that was so carefully explaining, albeit in brief, what a boolean was a few pages ago, it has now descended into the realms of spaghetti. It makes my head hurt just looking at it. Even a seasoned developer would have to waste a few precious minutes deciphering it, so I’ve no idea what a total beginner will take away. Ironically in Chapter 3 (building a Connect 4 game) he concentrates on splitting code up to make it as readable as possible. The Connect 4 game starts to bring in motion (the pieces sliding down), and has a good section on planning the graphics so everything is the right size and all fits. The illustrations are almost more useful than the source code as they convey a meaning, explanation and result in one shot, and they continue to be great through-out the rest of the book. The chapter wraps-up by adding AI to the game, both random and defensive play methods. This is a nice touch as it could easily have been left out. In my mind the above is actually more useful than the code that does it. I do wonder if there’s a potential game development book idea here – where it’s just a series of illustrations like the above that all lead to a finished game. With zero source code at all making it language agnostic! Back to the book… Chapter 5 builds Tetris, with all graphics generated via AS3 and the trusty Array restored back into service. Tetris is one of those games that is quite a bit harder to code than it appears when you play it. But the chapter does a good job of covering the raw basics. The pieces move whole tiles at a time, which removes that “damn, let’s quickly slide this bit over there” last-minute decision you were allowed to make on the Gameboy version. It’d be nicer if the pieces dropped and slid smoothly, but the way the game is coded that wouldn’t be an easy change. Chapter 6 finally see’s us creating an arcade game: Astro-Panic! Basically a Space Invaders styled shooter with slightly more dynamic alien movements. It’s a fun little game, looks nice and is full of action. Other than a small section dipping into the realms of trigonometry to handle movement vectors I can’t help but feel this would have been a much more interesting first game to make than Concentration was. The remaining chapters of the book deal with creating clones of Bejewelled, Puzzle Bobble and Ball Balance (one of Emanuele’s own games). It all ends with some recommended web site links before leaving you outside in the cold staring at the Index. The new games introduce a few new features but mostly deal with getting the game mechanics correct using what you’ve already been taught. It’s as if the book is trying to fulfil two tasks: teaching a beginner how to make games, and teaching them the fundamentals of AS3 at the same time. I can’t help but feel it should have lived up to the title and focused specifically on just making the games themselves. There are multiple good AS3 reference books out there, and while the explanations of AS3 syntax and features in here are just about adequate, they barely brush the surface and often use very beginner unfriendly terminology. It’s also here that I feel Emanuele should have been given a native English speaking proof reader (and if he had one, then a more thorough one!) because there are lots of times where it’s obvious he’s struggling to clearly explain in English what something is. Simple grammatical things that should have been picked up and corrected. If you have at least a bit of AS3 knowledge under your belt, or are a fan of his blog posts, then you should get on ok with this book. The process of breaking the game down into logical components, and the way in which he puts it together almost iteratively, is excellent. I’m a big fan of the “show and tell” approach, where you make small changes, but lots of them, and let the reader witness the results of those changes for themselves. If you are a seasoned AS3 developer then I think you can still get a little, because the approach to the game design and logic is mostly sound, and you’ll have the ability to totally re-code the source into something more readable! Personally I have issues with the source code. The variable naming, short-cuts taken and deeply nested constructs frighten the hell out of me. If I was shown this sort of code by a developer applying for a job in our team I’d politely file them away under the “last resort” pile. For me source code is at its most useful when you can read it like a good book, and that’s certainly not something you’re going to learn here. If you’ve already got a few Flash games under your belt then the majority of this book will be academic to you, but I suspect you aren’t the target audience. Basically if you like the sort of code and tutorials you find on his blog, you’ll like the book. If you don’t, you won’t! 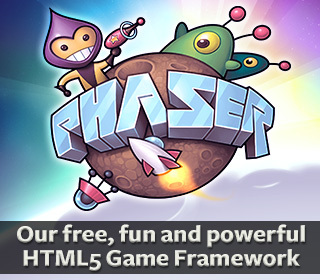 I applaud Emanuele for having written this, and I hope it inspires beginner developers who’d love to get into Flash game coding. I just hope they supplement it with some of the AS3 heavy-weights like the ActionScript 3 Cookbook or Advanced ActionScript 3 Animation as well, which offer the level of depth they will truly need, and dare I say it, slightly more elegant code in the process. 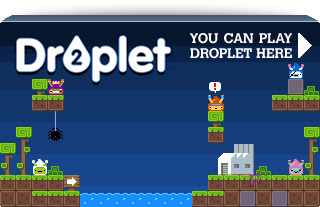 Buy Flash Game Development by Example from Packt Publishing. Posted on May 25th 2011 at 1:34 am by Rich. Another Flash Game development book for beginners … In the endless ocean full of Flash Game development book for beginners! 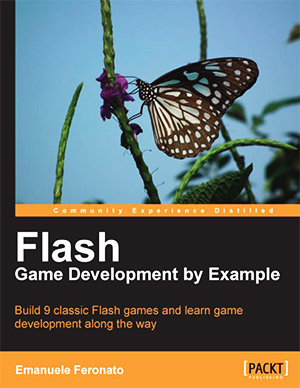 How about a book titled “Advanced Triple-A game development for the Flash Platform” for a change?! (Ok maybe we will see that when molehill is life 😉 ). Feronato doesn’t seem to care too much about OOP practices. At least his “all-in-one AS3 classes” appear like that. They often looks like the classes I’ve wrote when AS2 was brand new and I didn’t have the slightest clue about OOP. He has some interesting bits and pieces on his site but the execution feels a lot like the days of Flash about seven ago. And the Flash IDE … are there still so many masochists who use the Flash IDE to create games? I only touch that thing with tongs. Thinking about coding in the Flash IDE … a nightmare! “where it’s just a series of illustrations like the above that all lead to a finished game”… That would be my dream book!!! I wish for one all the time.